As expected, after two weekends of box office dominance, New Line Cinema's IT remake was finally dethroned. While it came in far lower than most projections, 20th Century Fox's Kingsman: The Golden Circle took the top spot at the box office with $39 million. Also as expected, Kingsman 2 easily beat its fellow newcomers The LEGO Ninjago Movie and Friend Request, although they both came in far lower than most projections. Box Office Mojo reports that Kingsman 2 opened in 4,003 theaters for a solid $9,743 per-screen average. While some had projected it to open in the $50 million range, the Kingsman sequel still managed to out-gross its predecessor, which opened with $36.2 million en route to a $128.2 million domestic debut and $414.3 million worldwide from an $81 million budget. The sequel was produced under a $104 million budget, but with its $61.2 million foreign debut, for a worldwide tally of $100.2 million, it's already very close to breaking even. Still, since the critics haven't been nearly as kind to this sequel as its predecessor, it will be interesting to see how large the second weekend drop will be. New Line Cinema's IT remake dropped to second place in its third weekend with a respectable $30 million, bringing its domestic tally to $266.3 million. Even after just three weeks in theaters, IT has already secured its place as the highest-grossing horror movie of all time, beating out the 1973 classic The Exorcist, which has held the record of $232.9 million for over 40 years. IT has also earned a stellar $211.7 million in international markets for a worldwide tally of $478 million from a $35 million budget, which could make it one of the most profitable movies this year. What's even more surprising is that the movie is such a big hit with no big name stars, except, of course, for author Stephen King, whose iconic novel the movie is adapted from. With their headquarters destroyed and the world held hostage, members of Kingsman find new allies when they discover a spy organization in the United States known as Statesman. 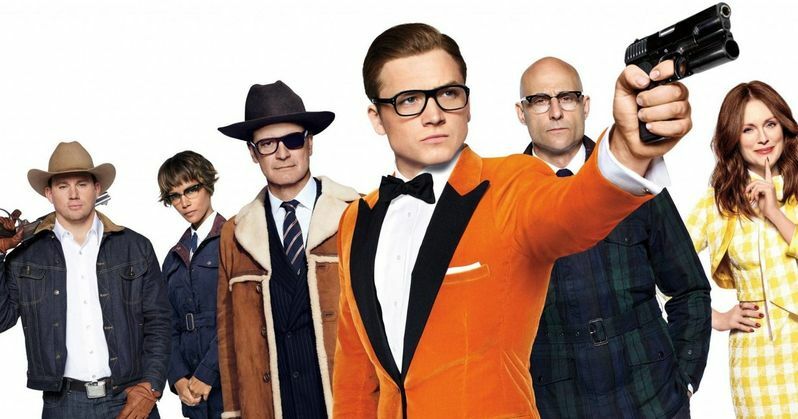 In an adventure that tests their strength and wits, the elite secret agents from both sides of the pond band together to battle a ruthless enemy and save the day, something that's becoming a bit of a habit for Eggsy. Kingsman: The Golden Circle is the second exciting chapter in the Kingsman trilogy. The LEGO Ninjago Movie opened in third place with $21.2 million, opening in 4,047 theaters for a decent $5,250 per-screen average. In this big-screen Ninjago adventure, the battle for Ninjago City calls to action young Lloyd, aka the Green Ninja, along with his friends, who are all secret warriors and LEGO Master Builders. Led by kung fu master Wu, as wise-cracking as he is wise, they must defeat evil warlord Garmadon, the Worst Guy Ever, who also happens to be Lloyd's dad. Pitting mech against mech and father against son, the epic showdown will test this fierce but undisciplined team of modern-day ninjas who must learn to check their egos and pull together to unleash their true power. The top 10 is rounded out by American Assassin ($6.2 million), Home Again ($3.3 million), mother! ($3.2 million), Friend Request ($2.4 million), The Hitman's Bodyguard ($1.8 million), Stronger ($1.7 million) and Wind River ($1.2 million). Also opening in limited release is Fox Searchlight sports drama Battle of the Sexes, which earned $525,000 from 21 theaters for an impressive $25,000 per-screen average. Focus Features' drama Victoria and Abdul earned $152,000 from four theaters for a stellar $38,000 per-screen average, while Oscilloscope Pictures' documentary Bobbi Jene earned $7,500 from one theater, and the independent documentary Unrest earned $10,700 from one theater. No box office data was released for Vertical Entertainment's horror movie Happy Hunting, Samuel Goldwyn Films' drama The King's Choice, Indican's action movie Ribbons, Shout! Factory's dramatic comedy The Tiger Hunter and A24's dramatic thriller Woodshock. There is no indication yet if these films will expand nationwide or not. Looking ahead to next weekend, four more movies will close out the month in wide release, Universal Pictures' crime-thriller American Made, Sony/Screen Gems' horror remake Flatliners, Novus' thriller Till Death Do Us Part and PureFlix's A Question of Faith. Also opening in limited release next weekend is Well Go USA's Chasing the Dragon, Freestyle Releasing's Don't Sleep, FIP's Judwaa 2, Scree Media Films' Literally, Right Before Aaron, Magnolia's Lucky, Sony Pictures Classics' Mark Felt: The Man Who Brought Down the White House, Newcity's Signature Move, The Orchard's Super Dark Times, IFC's Take Every Wave: The Life of Liard Hamilton, First Pond's Window Horses and China Lion's Youth. Take a look at the box office estimates for this weekend, and check back on Tuesday for next week's predictions. Will Tom Cruise's American Made Fly High at the Box Office? Can Kingsman 2 or Ninjago Take Down IT at the Box Office?